If this kit is ordered separate from the Norcold cooling unit we will need the confirmed AC element for the cooling unit have now or replacing rather it's the 2 elements of the 90 degree or 45 degree bend. This is a SPECIAL, when you upgrade to a Amish Helium Charged unit or the Standard Amish built units, but want to replace elements and fans this Package will replace both fans, both AC 225 watt elements, fan switch, . Note! 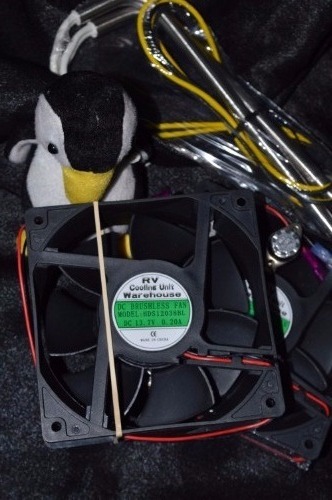 You use the OEM Fan wire harness. This Package of 2 new High Volume fans, new fan switch, and 2 new AC Heating Elements for the Norcold Refrigerator Cooling Units. Both fans and fan switch are used on all Norcold 1200 series models. You can either replace your defective fans one at a time or use this Package Special to get great savings. Norcold uses 2 fans to increase the air flow to lower the high heat temps to the Condenser Fin area of the cooling units, plus the main reason is to increase the air flow through the condenser fins to remove heat that has been transfered from the inside of refrigerator to the outside coils Fins. Without good air flow, this causes higher heat. By keeping a good air flow, lowering heat you prevent failure, due to either high ambient temps. On all the large 4 door Norcold refrigerators, if you get the code of "NO CO", be sure to confirm the fans were working during refrigerator use. The fan failure is the most common problem of cooling unit failure or lack of cold in the refrigerator food zone. This 2 Fans, Fan switch, and 2 heating elements package is better than 1/2 of the retail price.